1100 Lamar Street: Housing the main post office as well as federal offices, this stately 1930’s building is a classic example of the Art Deco style. It has been recommended as a National Register landmark. Southeast corner of Seventh and Ohio Streets: Within Depot Square Historic District. Life in a western frontier town such as Wichita Falls was hard and sometimes dangerous in the early days. 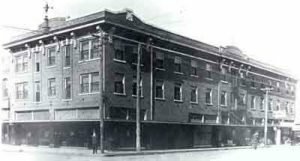 On February 25, 1896, two cowboys robbed the City National Bank and killed the cashier, Frank Dorsey. Fleeing on horseback, Foster Crawford and Elmer “Kid” Lewis were soon captured and on February 27, were hanged by an angry mob on this corner. 503 Eighth Street: Within Depot Square Historic District, National Register of Historic Places, Texas Archeological Site. 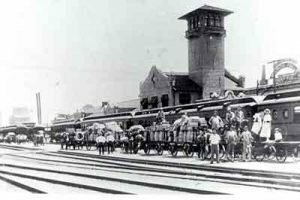 Railroads possibly more than any other factor were responsible for the founding, settlement, growth, and stature of Wichita Falls. Built in 1909, the Kemp and Kell Building Depot, now known as the Route Building, is an excellent example of the Renaissance Revival style of architecture. Industrialists Frank Kell and Joseph Kemp came to prominence as a result of their railroad involvement, and the Route building housed offices for their expanding interests as well as serving as both a passenger and freight depot. Near the geographic center of what was then the hub of the town’s activity, the Route building is all that remains of the once flourishing railroad legacy of Wichita Falls. Home of Wichita Falls industrialist and civic leader, Frank Kell, this house of Colonial Revival style with Neo-Classical elements was considered to be on the edge of town when it was built. Because Frank Kell played such a key role in the region’s formative years through his vast milling and railroading interests, the family home was often a gathering place for state and national leaders. 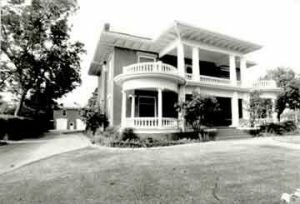 It was continuously occupied by members of the Kell family until it was purchased in 1980 by the Wichita County Heritage Society. Furnished with original furniture and objects belonging to the Kells, it now serves as a house museum open to the public for tours, and it continues to be a showcase of community activity and pride. Agriculture has played a major part in the development of Wichita county, and farmers from all over North Central Texas bring their produce to this busy market, the style of which is a contemporary adaptation of the beloved Union Passenger Station built in 1910. At the peak of the railroad passenger era during the Burkburnett oil boom of 1918, more than thirty trains boarded and de-boarded daily. Union Station was abandoned and demolished shortly after the last passenger train came through Wichita Falls in 1967. 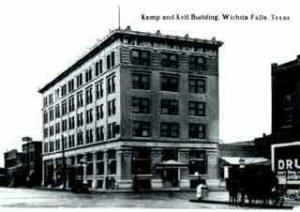 The early 1900’s saw an unprecedented building boom in Wichita Falls with exceptional growth experienced in the downtown area. The Kemp-Kell Building, Classical Revival style with Neo-classical elements, now known as the Holt Hotel, was one of the first five story office buildings in the city. It served for a time as the City National Bank Building and was later converted to a luxury hotel where Eleanor Roosevelt and Helen Keller once stayed. 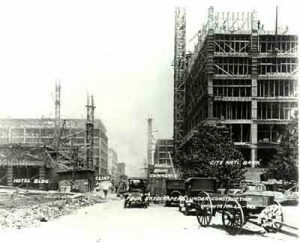 Following its completion, other significant buildings were built west on Eighth Street which became known as the Eighth Street Corridor and the gateway to the city.